← Mormonism, Christians Like Us? Many people vied for the office of President of the Church left vacant at Smith’s death. 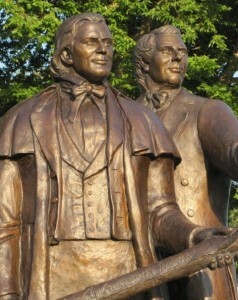 The two main contenders, however, were Sidney Rigdon (First Counselor in the First Presidency) and Brigham Young (President of the Quorum of the Twelve Apostles). Church members were divided and argued over the identity of Smith’s successor. 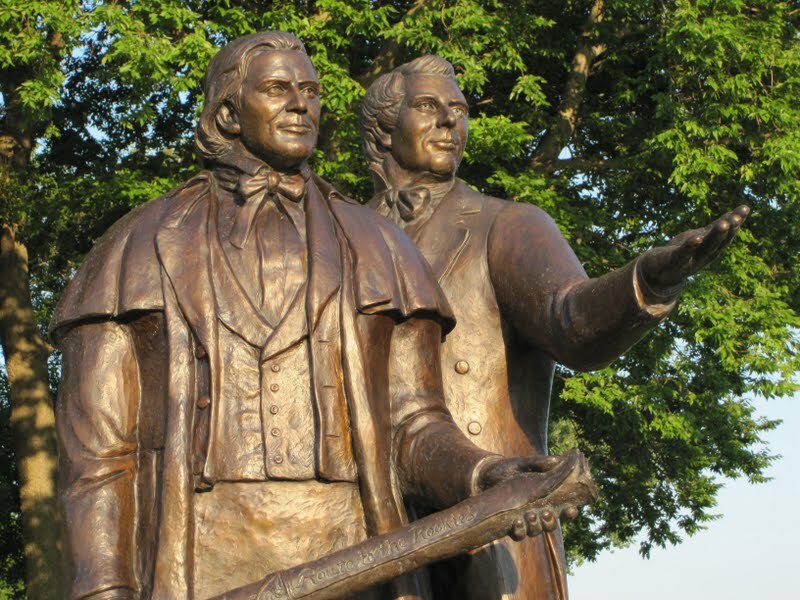 A special meeting was called in Nauvoo for August 8, 1844 to decide who would lead the floundering church. Sidney Rigdon spoke and made a case for his ascension to the office of President. Then Brigham Young spoke in behalf of The Twelve. It was then that the miracle occurred. Furthermore, history also suggests that there was no transfiguration on August 8 to guide the people toward God’s will in the matter. According to Mr. Van Wagoner, “no known contemporary record supports a supernatural occurrence” at either the morning or afternoon August 8 meetings, but there are plenty of accounts from later years that mention Brigham Young’s transfiguration. Mr. Hyde’s testimony is astonishing – because he was not in Nauvoo on August 8, but rather arrived in the city five days later. One contemporary account of the transfiguration of Brigham Young was found in the diary of Mormon George Laub, thought to have been written in 1846. Mr. Van Wagoner explains, “This small tan-colored leather diary, which has misled many scholars, has now been determined to be a copy of the original by Laub himself, with additions.” The original diary has also been discovered, and it contains no reference to Brigham Young’s transfiguration. This entry was posted in Brigham Young, Mormon Leaders and tagged Brigham Young, Mormon Myths, Succession Crisis. Bookmark the permalink. In the preexistence we were told that we would be tested. Our test would be showing our faithfulness in living the Gospel of Jesus Christ and sharing it with others. We wanted to come here to this earth and take on our first estate, a body of flesh, blood and bone just like our Father in Heaven, only that He is a glorified Being of only Flesh and Bone. We were given instruction, those instructions were that a veil of forgetfulness would be placed over us and we would then have to walk in Faith. If we proved ourselves worthy, meaning faith in Jesus Christ as our Lord and Savior then the sacrifice He made would gain us entrance into the Kingdom Of God here on earth with all its ordinances and covenants we would be asked to keep. One of our test would be to show forth Charity to all, that is the Love of Christ to all individuals also considered His spiritual children here on earth. Christ blood washes us clean of sin if we accept Him and His ordinances. We of ourselves cannot be saved since we are all sinners and only one such as Christ, pure and undefiled could ever satisfy justice, that being the payment for our sins by shedding His Blood to satisfy justice. A test? Do all grades qualify as passing. Interesting that the scriptures say that only God knows the heart and mind of man, and that judgement will be dealt accordingly and fairly, so yes all grades are looked at by a fair and righteous teacher. 2. If you were to evaluate your performance in the course so far, what grade do you think you’ve earned? Earned? like works? I don’t believe my works will save me, but my performance will be based on love and charity. What other things will He evaluate? Not sure, but it will have to be something to do with the promises I have kept and the ordinances I performed. That in it self would take some time to teach you. Both the Bible and Book of Mormon are worth reading to find just what God expects of us and the commandments we need to keep. 3. Is the grading system based upon a curve? Or is it based upon an absolute standard? The Lord of the Vineyard. Remember the worker who hired himself out for a day at a certain pay, and then there was the worker who was only hired for half a day. Both were paid the same amount, yet the one who worked all day was upset, why should I worry about what someone else does, God does not grade on a curve He treats all the same, whether one has strived to live righteously all his life or the one who just found the Lord and changed his life. Both are the same in the eyes of God. Repent and turn towards the real Christ Helen, you are decieved! By the way Helen, I HAVE read the entire Book of Mormon from beginning to end, got my degree from BYU where I had to take classes on the Book of Mormon and I give you my testimony that I know the Book of Mormon was written by Joseph Smith the sinner and was not given to him by God, Jesus Chirst or any angel named Moroni. I was once decieved like you, but by the grace of God I have seen the light. I pray the same for you. Very good Sandi B. and just what is your theory of where the Book of Mormon came from? There are probably 10 different versions of how the Book of Mormon came to be, what one have you chosen as the most reliable and truthful? Personally, I like the one about plagiarism, yet when I checked it our I could not find a single paragraph that was plagiarized from someone else. A). How did Joseph know so much about the Arabian Peninsula? B). If the gold plates never existed, how did Joseph get numerous witnesses to stand by their stories until their dying day, even when some of them later became angry with Joseph and left the Church? C). How could Joseph have known about ancient cement technology in the first century B.C. in Mesoamerica? D). Why does ancient Mesoamerican geography AND culture provide a plausible setting for the Book of Mormon? E). How could Joseph Smith make up dozens of names in the Book of Mormon that would later be shown to be authentic ancient Semitic names? F). Where did Joseph Smith get the idea of ancient scriptures written on metal plates? G). How did Joseph Smith know about ancient practices regarding preservations of sacred texts? H). Why do other ancient documents support the Book of Mormon’s idea that the ancient Joseph prophesied of Moses and Aaron? I was hoping an exMormon would jump in here and respond to our buddy Helen regarding the BoM. But of course, like me, you won’t have any credibility when it comes to commenting on the BoM either. I’ve never read it. You have read it and even studied it at the flagship college of Mormonism, BYU. The only people who have credibility in Helen’s world are those who believe the BoM. It’s a Mormon game that I won’t play. So you see you and I have the same level of credibility so I figure why waste my time reading it because it will never be enough. There’s plenty of information about the BoM available for anyone who wants to take the time to access it and make a decision as to whether or not the BoM is historically, anthropologically, geographically, linguistically or scientifically accurate. As to whether or not the BoM provides a testimony of Jesus, so what? The book Ben Hur does that as do other novels. I find it intriguing that Mormons like Helen fight tooth and nail defending the BoM and then don’t follow the God that is revealed there. At least the early break away sects of Mormonism have the integrity and good sense to recognize that there’s a significant difference between the God of the BoM and the pantheon of gods that Joseph Smith conjured up in his later career. I also have read the BoM and all the standered works, plus many other LDS approved books, and been to LDS church services. The RLDS and the FLDS also follow JS and believe the BoM and yet you claim they are not “real” LDS, Or at least LDS in general dont accept them. LDS dont teach they are brothers and sisters yet they believe closer to you than we do. I have prayed about the BoM and the LDS church many times and have been told it is false. You need to do more than pray and want to believe, I want to believe that I am rich and can fight like batman, but wanting to believe will not make it so. The Bible and the BoM since it was plagurised from the Bible all teach, search the scriptures to know if these things are true. They do not teach to pray about truth. Quote James if you like, but that is not saying, pray for truth, it is you praying for wisdom, Wisdom is using your Brain to know if something is true. You can use your brain all you want, but if their is ZERO evidence, then you dont know if it is true or not and simply need to rely on blind faith. This is no different than the atheists that so badly want to believe we arrived here on earth from Lightning striking gasses that caused life, They cannot prove the big bang, they can only have faith it happened and really want to believe since they want to really believe God does not exist. Yes, I knew that was pretty much what I would get. I will not be answering Helen’s questions. I have read it and I know its false and that she is decieved. If she doesn’t repent she is going to find out just how wrong she was, but she can’t say nobody told her. She will be without excuse. Its seems that her heart is hardened to the truth. Thanks for your answers to my three questions. I’ve summarized your responses below, to see if I understand. I’ve added in my comments, too. I pose some other questions, but they are more rhetorical; don’t feel you need to answer them except to yourself. God bless you, Helen. 1. For this course, do all grades qualify as passing? Are there any failing grades? It looks like you believe you existed before you were born, though its memory was removed. And the purpose of this existence is to display your worthiness, or righteousness? This display includes faith in Jesus Christ to be your savior; to do something or to save you from something. And keeping covenants you have made; that is, your promise to keep the law? I agree with you that God knows the heart and mind of man. So your grading will be dealt with fairly. God knows everything. In fact, he knew everything from before the foundation of the earth. (He knew of Helen’s and Brian’s correspondence these last few days.) In Jeremiah 17:9, God describes the heart of man. What do you think of this description, Helen? Has God graded your heart? It looks like you’re not sure what your grade would be. That’s understandable; it was a difficult question. But you would guess your performance is based on ordinances (rites?) you have performed. And promises kept; your promise to keep the law. Do you have to keep all the law? Or can you keep part of it (James 2:10)? Have you kept the law, Helen? You’ve said that God does not grade on a curve. So it must be upon an absolute standard. I agree with you, Helen. And you’ve stated that someone who has tried to be righteous all his life, and another who just recently tried to be righteous, are viewed as the same in the sight of God? I agree they would be viewed as the same. Since God has declared that no one is righteous (Romans 3:10), could it be that the verdict is already in? God has known everything forever. So is he qualified to make such a blanket verdict, pronouncing the guilt of man? Is this life a test? A course? Well, if it is, I have certainly failed the course. I believe that God knew this from eternity past, and decided to grade not my coursework, but his. He saved me from being graded; from judgment. (John 5:24). He decided to save me from judgment before I was ever born. And then, eleven years ago, he did. What about the course I’m now in? I believe it is to express gratitude to him, yield to him as he makes me his workmanship, and share with others what he has done for me. Let me address both issues. First what is the context of this Biblical text? What is not said by Brian? Has God graded yor heart? So Brian, why does God use the word search if he know all. To search implies there is more to it. Quoting Falcon, not Brian that was a error on my part in the above post. Of course you overlooked what I stated, God will judge me both on keeping the commandments and my performance. Charity or the Love of God for others. Of course you go directly too only me keeping the covenants I make and consider that performance. Interesting bit of misunderstanding, I wonder why? You do well to quote James 2:10 yet leave out Charity and performance therein. 14 What doth it profit, my brethren, though a man say he hath bfaith, and have not works? can faith save him? 17 Even so afaith, if it hath not works, is dead, being alone. Then you state ” is it a absolute standard” since it is not a curve. Some gifts coming from the Atonement are universal, infinite, and unconditional. These include His ransom for Adam’s original transgression so that no member of the human family is held responsible for that sin. Another universal gift is the Resurrection from the dead of every man, woman, and child who lives, has ever lived, or ever will live on earth. What is the absolute standard. Eternal Life and membership into His Kingdom through Faith, Repentance, Baptism and Gift of the Holy Ghost. Absolute standard for Eternal life, but not the resurrection of all, that is a free gift.